Conditutto Piccante is the result of a blend of six Herbs from the Iblean heights with a spicy kick that will enhance the taste of your grilled meats, fish, vegetables or suasages! Also excellent with roasted potatoes, chicken and most dishes. An excellent seasoning mix to your food! A seasoning mix same as the above but without the peperoncino that can be used to enrich most of your recipes! 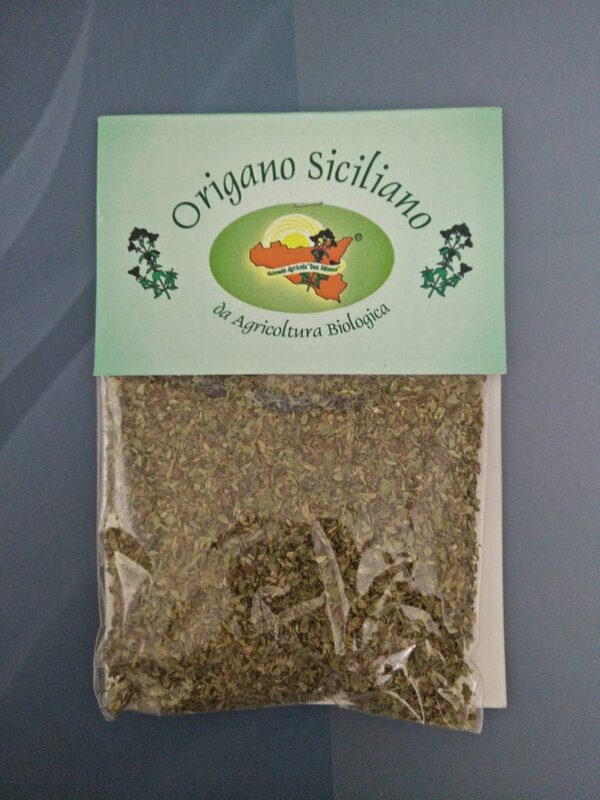 A classic Mediterranian herb carefully dried and flaked to retain the plant's aromas. Charmingly fragrant rosemary herb is the perfect potherb to have in your kitchen. It is one of the recognized herbs for its noteworthy health benefiting phytonutrients, antioxidants, and essential oils. Rosemary belongs to the family of Lamiaceae, of the genus, Rosmarinus. Its botanical name is Rosmarinus officinalis. The herb is thought to be originated in the Mediterranean region as a wild, strewing evergreen perennial shrub. Today, it is grown in nearly all parts of the Mediterranean area and Asia Minor as a major culinary herb. In order to keep the fragrance and flavor intact, the herb is generally added to cooking recipes at the last moments, since prolonged cooking would result in the evaporation of its essential oils. Fresh or dried rosemary leaves are part of the Mediterranean cooking, employed in the preparation of a variety of recipes. Rosemary goes well with tomatoes, aubergine, potato, zucchinis (courgettes). Finely chopped fresh leaves are used in the preparation of delicious sautéed rosemary potatoes. Thyme herb is packed with numerous health benefiting phytonutrients (plant-derived compounds), minerals and vitamins that are essential for overall wellness. One of the popular among culinary herb plants, thyme originally is native to the southern Europe and Mediterranean regions. Botanically, it belongs to the family of Lamiaceae, in the genus of Thymus. Thyme herb imparts intense flavor to the recipes, and therefore, should be added sparingly. In order to keep its fragrance and flavor intact, thyme herb is generally added at the final stages in the recipes. It is done so to prevent evaporation of its essential oils in cases of extended cooking methods. Laurus nobilis is an aromatic evergreen tree or large shrub with green, glabrous leaves, in the flowering plant family Lauraceae. It is native to the Mediterranean region and is used as bay leaf for seasoning in cooking. Its common names include bay laurel, sweet bay, bay (esp. United Kingdom), true laurel, Grecian laurel, laurel tree or simply laurel. Laurus nobilis figures prominently in classical Greek, Roman, and Biblical culture. The plant is the source of several popular herbs and one spice used in a wide variety of recipes, particularly among Mediterranean cuisines. Most commonly, the aromatic leaves are added whole to Italian pasta sauces. They are typically removed from dishes before serving, unless used as a simple garnish. Whole bay leaves have a long shelf life of about one year, under normal temperature and humidity. Whole bay leaves are used almost exclusively as flavour agents during the food preparation stage. Ground bay leaves, however, can be ingested safely and are often used in soups and stocks, as well as being a common addition to a Bloody Mary. Dried laurel berries and pressed leaf oil can both be used as robust spices, and the wood can be burnt for strong smoke flavouring.